There are two kinds of wood – wood that is rotten, and wood that one day will be rotten. This statement may seem a bit extreme, but it is a fact. Wood is a product of nature and its nature is to return to the earth in a natural process. As professional log home contractors, it is our job to ensure that wood used in the construction of log homes lasts for many years. Borates have been used to preserve wood for many years, and because people have lately become more concerned with the toxicity of products used in their homes, it has steadily grown in popularity. We will discuss the use of borates to preserve log homes in detail. What are borates and how do they work? Simply put borates or borax are naturally-occurring water-soluable salt-like acids. They are about as toxic as table salt to humans and pets but kill wood-consuming insects like termites, powder-post beetles, and old house borers. More importantly, it kills the wood destroying microorganisms that cause rot. Rot in log or conventional homes causes hundreds of times more damage to homes every year than damage by insects. For borates to be effective, they must be actually eaten by an organism. Borates are not effective against carpenter bees because they do not actually consume wood – they just chew it. Interestingly enough, consuming borates does not instantly kill termites or other wood destroying insects. It does however kill the bacteria in their digestive system. These bacteria actually help the insect digest the cellulose fibers that make up a piece of wood. Without these bacteria, the insects die of starvation. Funny how nature works. Borax is a component of many detergents, cosmetics, and enamel glazes. It is used to make buffer solutions in biochemistry, as a fire retardant, as an anti-fungal compound, in the manufacture of fiberglass, a texturing agent in cooking, as a precursor for other boron compounds, and along with its inverse, boric acid, is useful as an insecticide. Perma-Chink Systems markets four different forms of borates for the purpose of preserving wood. 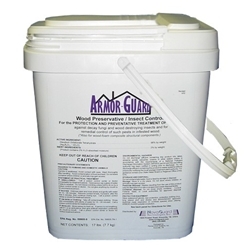 Armor Guard is sold as a powder that is mixed with water on-site and then sprayed onto wood. 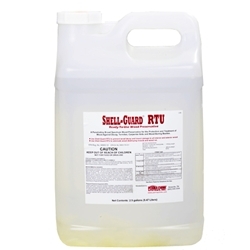 Shell Guard RTU comes pre-mixed and is Ready-To-Use. Shell Guard Concentrate contains the highest concentration of Borax with food-grade glycol added to deepen penetration into wood and must be mixed with additional water on-site. 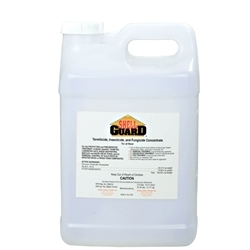 The Concentrate is usually used in extremely wet or rot-prone conditions or on active rot or insect infestations. 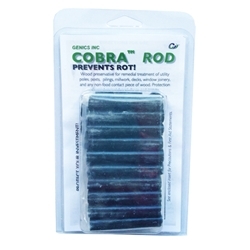 Cobra-Rods are made from borax and copper which have been compressed and heated to form a glass-like rod of borax which is inserted into holes drilled in rot-prone areas like porch posts. Cobra Rods are so effective that they are now inserted into all new utility poles installed in the southern U.S. Please call us or visit www.permachink.com for more detailed preservative application information on the use of these products. Sold as a powder that is mixed with water on-site and then sprayed onto wood. Comes pre-mixed and is Ready-To-Use. Contains the highest concentration of Borax with food-grade glycol added to deepen wood penetration and must be mixed with additional water on-site. The Concentrate is usually used in extremely wet or rot-prone conditions, on active rot, or insect infestations. Made from borax and copper, are compressed and heated to form a glass-like rod. The rods are inserted into holes drilled in rot-prone areas, like porch posts. Cobra Rods are so effective that they are now inserted into all new utility poles installed in the southern U.S. When most homes are constructed, the logs are clean and smooth with very few checks, or cracks, in the logs. During the first few years, these checks open up, expand, and deepen. Many checks extend to the center of the log – much deeper than any topical application of borax can effectively reach. These exposed deep checks CAN and DO collect water. Over time, this will cause the log to rot. It is very important to include the application of borates into checks during any and all maintenance work done on a log home prior to a maintenance coat of stain, clear coat, or caulking. I have used borate treatments over the years in many other special and unusual applications that I will list below. For antique log homes – Owners of antique log homes have spent a lot of money purchasing old logs, timbers, and siding because of their unique appearance. They love that silvery-gray rough texture inherent to old timbers. They are very reluctant to remove this look in order to properly apply a protective waterproof coating that would protect these logs from rot. An alternative for this unique and growing segment of the market is to simply treat the exposed logs every year with borates. The treatment must be done every year because borates are water-soluable and rain will eventually leach the product out of the wood. The borates will not change the color of the wood and it is almost impossible to over-apply. For additional protection against insects inside new homes – During initial construction, spread powdered Armor-Guard into open stud wall cavities and on the floor where base cabinets are to be located. Then close up the stud walls and install the base cabinets. The borate powder will stay in those locations forever and kill all roaches and ants that come in contact with Armor-Guard. Now, I told you earlier that insects must consume the product to be effective and that is true. Insects can crawl through the powder without being harmed. However, ants and roaches belong to a group of insects which constantly groom themselves to stay clean – or a clean as a roach or ant can be. To stay clean, they lick their legs and other body parts. When they do, they consume the borate and will die. For log replacement projects – I highly recommend a thorough treatment of all replacement logs and log siding with liquid borates and Cobra Rods. The chances are that homeowners who have not maintained their homes in the past will probably neglect them in the future. A more permanent treatment today will lower your liability in the future as a contractor. An even better plan would be to have replacement logs pressure-treated with borates. There are probably more companies that provide that service, but I do know that Appalachian Log Structures, Lok-N-Logs, and Sisson DuPont Carder will pressure-treat logs for use in log replacement. They all also produce many different log profiles. If I were to replace a log on a customer’s home that was pressure-treated, I would have no problem extending a lifetime warranty on that log – a good selling point for log home contractors. For active infestations – I have successfully used borates against insects that are actively living in isolated spots on structures. In the pictures below, powder-post beetles infested barn wood on my porch. I injected Shell-Guard RTU into the actual holes using a syringe made for injecting marinade into food. Any plastic syringe will work when held tightly against the hole to inject the liquid. I treated these holes one afternoon and found them dead on my counter-top the next day. I may have simply drowned them, but that was a year ago and they have not returned. The same type of method can be used in isolated areas of rot or termite damage using – believe it or not – a bulb-type turkey baster or cheap ketchup squirt bottle. Simply drill angled holes into the wood on the upper part of the log (you have to drill to get the product into the wood past the existing water-proof stain on most logs) and insert the bottle or baster full of borate solution into the hole and walk away for a couple of days. The liquid will slowly soak into the log and saturate a large section of log. If the product simply flows quickly into the log, then you will probably be facing a log that is too far gone and it may need to be re-faced or replaced. Once the product is deep in the log, it will soon kill the rot or termites. I recommend Shell-Guard Concentrate for this procedure as it has the highest concentration of borates. Remove the delivery device and add a Cobra Rod as extra insurance and longevity. For log railings – Log railings exposed to the weather are a maintenance nightmare. They are very difficult to maintain a stain coating on because they develop checks on the upper curvature of the rails which gather water. However, when located on a raised deck or stairway, they can be downright dangerous. How many homes have you visited a homeowner who warns you not to lean on the railing during your inspection of the home? Think about it – the only thing between you and serious accident is a rotted handrail! Many state codes now require pressure-treated handrails. These things are a serious safety problem – and this warning does include cedar or redwood which last longer, but also rot. If you are at a new home site, you can treat new hand rails as they are assembled by drilling a hole into the end of each spindle and inserting a Cobra Rod. The borates and copper will dissolve into the surrounding wood and protect against rot. I would also soak all the components in one of our other liquid borate products. A pain, but better than an accident. If you have more questions, please contact us 1-800-548-3554. Please visit Perma-Chink's How-To Tips or Preservatives for more detailed application information on the use of these products.